The LivCos Web platform not serves a Web page view on your Cosmos data, the Web GUI also allows you to manipulate your content. In the initial navigation mode, LivCos Web pages can be used like every other basic Web page. You click on links to navigate, select text to copy and use the browser's context menu to go back to the previous page. The F2 key sensitivity and the edit mode switch tool are the only specialties on the page. Beside the "normal" reader's mode, LivCos Web offers an additional mode to select and edit the data entities shown. This edit mode is optional and not every information, you can see, is allowed to be selected and/or changed. You can toggle between the edit and navigation mode by pressing F2 or clicking the small triangle in the top-left corner of the page. In the normal mode the triangle appears only in proximity to the mouse cursor. In the edit mode it stays visible. A right click immediately (< 0.5s) followed by a left click is another way to switch modes by mouse. In the edit mode the Web page behaves a little different. A click on a presentation of an editable entity marks the selection. Also a context menu (right click) and multiple key shortcuts become available. The standard context menu for a right click from the mouse is replaced by a special menu, offering various actions for the selected entity. Via the "Edit..." menu or by pressing the "E" shortcut key, you can open the editor panel to enter or change the entity's data. Most of the visual text you can also edit directly by double-clicking the text. The double-clicked word will be selected and the inline-edit is listening to your keyboard. The editor panel allows you change the attributes of a content entity. In a form-like panel you can fill in text, choose dates and/or enter other type of data. Single or multiple lines editors allow you to enter plain or rich text into the Cosmos. In the multi-line rich-text editor you can enter strong/bold (Shift-Ctrl-B), emphasized/italic (Shift-Ctrl-I), underlined (Shift-Ctrl-U), strikethrough (Shift-Ctrl-K), subscript (Shift-Ctrl-D), superscript (Shift-Ctrl-P) text and links (Shift-Ctrl-L). Multi line rich text input without a label. Links are individual entities, so you can select and edit them directly. Select and edit a hyperlink within the normal text. Simply enter date and time values with a special input mask. 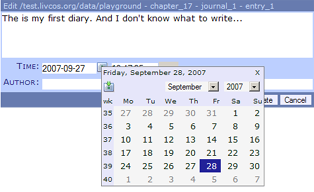 The date / time input of a journal entry. Date inputs offer special support with a date picker. The date picker lets you choose a date from a calendar. Select one of the possible enumeration values. The editor for an 'ordered' or 'unordered' list entity. In the edit mode cut & paste (Ctrl-C, -X, -V) work with a LivCos clipboard on the server, allowing you to copy and move entities within the Cosmos. The system clipboard on the client is only active for text inputs in the editor panel or in an inline-edit. To select any text on the page and copy it into other applications you need to switch back into the "normal" mode. In the context menu you can choose to "copy" or "cut" the selected entity. Then you select an entity to "paste" before or into. In addition to the commonly known keyboard shortcuts for copy (Ctrl-C), cut (Ctrl-X) and paste (Ctrl-V) you can press Ctrl-Shift-V to "paste into" the selected entity. The easiest way to insert a new entity is to copy (Ctrl-C, Ctrl-V) or clone (C) an existing one. Press Ctrl-Shift-Enter to add a new, empty entity of the same type as the selected one. 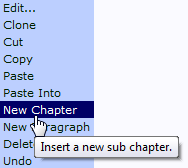 A new, empty chapter after pressing Ctrl-Shift-Enter on the selected previous sibling. Certain, often used entities can be inserted via context menu. Insert a new row into the body of the table. In some entities you should only insert some specific sub-entities (no "Paste Into" menu). When you like to insert a specific new entity, but you don't have a source right at hand, consider to collect some example entities throughout the Cosmos into a template document. We even have a name for such a document. The "palette" view shows the root chapters as separate blocks. Starters can bookmark the default palette at livcos.org. Several short cuts are available to manipulate the data via keyboard. all F2 Toggle edit / default mode. edit Ctrl-Cursor Select entities visually (down, up, left, right). edit Tab Select the next entity view in the hierarchy. edit Shift-Tab Select the previous entity view in the hierarchy. edit M Open context menu for selection. edit E Open editor for selection. edit C Clone the selected entity. edit Insert Open templates panel to select and insert a new entity into selection. edit Delete Delete selected entity. edit Ctrl-C Copy selected entity into the clipboard (on server). edit Ctrl-X Cut (move) selected entity into the clipboard (on server). edit Ctrl-V Paste the most recent clipboard (on server) entry before the selected entity. edit Ctrl-Shift-V Paste the most recent clipboard (on server) entry into the selected entity. edit Ctrl-Z Undo the last change. Undo the undo action to redo. edit Ctrl-Shift-Enter Insert a new entity of the same type after the selected entity. edit Enter Perform the selection (open the editor). edit ESC Remove current selection (unselect). context menu Cursor Navigate menus. context menu Enter Perform menu action. context menu ESC Close context menu. editor Ctrl-Enter Update the entity with the changes entered and closes the editor. editor ESC Close editor panel. rich-text editor Ctrl-Shift-B Formats the selected text in the rich-text editor (or inline editor) with a bold font weight. rich-text editor Ctrl-Shift-I Formats the selected text in the rich-text editor (or inline editor) with a italic font style. rich-text editor Ctrl-Shift-U Formats the selected text in the rich-text editor (or inline editor) with a underline text decoration. rich-text editor Ctrl-Shift-K Formats the selected text in the rich-text editor (or inline editor) with a strike-through text decoration. rich-text editor Ctrl-Shift-D Formats the selected text in the rich-text editor (or inline editor) with a subscript text decoration. rich-text editor Ctrl-Shift-P Formats the selected text in the rich-text editor (or inline editor) with a superscript text decoration. rich-text editor Ctrl-Shift-R Removes any format from the selected text. rich-text editor Ctrl-Shift-L Inserts a link with the selected text as the label. You can specify the URL in a following step editing the link entity. rich-text editor Ctrl-Shift-N "Unlinks" the selected text. It removes all the link entities for the selected text. templates ESC Close templates panel. To signal the status of the different background server requests a small message is displayed at the right top of the page. Status message to signal a successful entity info load. While info status messages dissolve automatically, error messages stay visible until the next reload of the page (F5). For some pages the server needs to perform a longer task to complete. To inform the user about how the server is doing, several job status pages might appear before the actual content is shown.